When pairing wines with a big turkey dinner, it’s time to take sides. By “taking sides” I mean that you need to choose your wines with a mind to the varied tastes and flavors of your side dishes. Turkey – the main event – is actually quite neutral in flavor and can pair nicely with a variety of wines. Side dishes for turkey, however, include the sweet (think yams topped with mini marshmallows), the spicy (sausage stuffing), the salty (gravy), and the tangy (pickles, olives, and cranberry sauce). It takes a fruity, acidic wine with no chance of clashing flavors to match that schizo of a meal. I know this subject has been talked to death, that opinions on the matter run hot, and what the world needs now is hardly one more blog post on what wines to serve on Thanksgiving. So, it is with humility and a bit of trepidation that I offer the following “Bubbly Professor Rules” on wines for Thanksgiving. Rule #1 – Choose a Wine with Lots of Crisp, Lively Acidity: Tangy foods, such as cranberry sauce, citrus, or anything from the relish tray, need to be paired with wines that can stand up to the challenge. To be safe, serve a wine that has lively acidity to begin with and your wine will maintain its balanced flavor even in the presence of acidic foods. Rule #2 – Choose a Wine with Lots of Fruity Flavors: Cranberry Sauce, Sweet Potatoes, Creamed Corn and Yams…due to the fact that they have a degree of sweetness, these foods require a wine that has a very fruit-forward style. A wine with a hint of sweetness is ideal, as any sweetness in a food will diminish the fruitiness or sweetness of a wine. It’s best to start with a wine with a good deal of fruit flavors, and maybe even sweetness, in order to preserve the wine’s balance with these types of foods. Rule #3 – Choose a Wine that is Low to Moderate in Tannin: Tannin is an integral part of the taste, flavor, and structure of most red wines, and the component that gives many wines their “grip” and a “velvety” feel in others. So, even though we love it, we must be careful with tannin in the wines we serve on Thanksgiving, as too much tannin can clash with salty tastes or spicy flavors. To avoid a clash of the titans that might end up with a metallic or bitter taste in your mouth, keep those red wines low in tannins and smooth! Rule #4 – Choose a Wine with Very Little, if Any, Oak: Oak is a beloved flavor enhancer of many wine styles. However, highly oaked wines can clash with some food flavors. Flavors that are slightly sweet, a bit fruity, or a tad spicy can all spell trouble when combined with oak! Rule #5 – Choose a Wine that is Moderate in Alcohol: Alcohol, while part of what makes wine so delightful, has a tendency to clash with certain tastes and flavors, and with all the flavor mingling going on at Thanksgiving, a clash is likely. If at all possible, keep your wine choices in the moderate alcohol range. 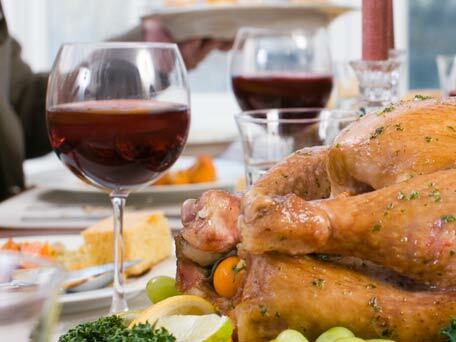 Let’s face it…turkey already has enough drowsiness-inducing tryptophan to put you to sleep. We don’t need any help from excessive amounts of alcohol! Dry Rosé – an all-around great choice! Or, of course, you can use this philosophy: Serve anything you like…it’s just one day out of life! Happy Holidays, Everyone!! No matter what you serve, enjoy the day and give thanks for all the good things in your life! You’re very welcome!! In the coming days I’ll have versions for Holiday Ham and a Roast Beef Feast!! Hi Jane, What an informative guide for those of us who have no clue! Shared it on my FB page, too. Thanks! Thanks so much!!! All this talk of turkey has really put me in the mood for a nice Sparkling rose’!!! Thanks, Miss Jane – I absolutely love this guide. Love the fact that you actually explain to us the ways the wines and foods will interact. Very helpful – now I’m off to get some dry rose’ for me and some Moscato d’Asti for my mom. Hi Miss Jane – So glad to know my all-time favorite Turkey day wine – Oregon Pinot Noir – is a good choice. Great info.